The "IN" Show covers the news as it comes in - and as it happens - for the Long Beach Comic Con 2010! 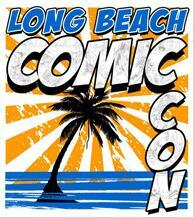 The Long Beach Comic Con 2010 was truly a convention that celebrated - in every way - all things comic books. As its name gives away, the LBCC was held in Southern California's magnificent Long Beach Convention Center [in Long Beach, California]. For many of the fans, cosplayers, and exhibitors in attendance, it lived up to the description as being "an experience unlike other comic conventions." Not only had it been developed by some of the industry's most ardent supporters; but, it with its running agenda, it fast became a gathering of professionals, fans, artists, celebrities, newbies, and more! All this done in order to enjoy all aspects of comic books and pop culture. Along with all the expected (and demanded) convention fare - screenings, panels, autograph sessions, artists and writers, costumes and such - there were quite a few surprises! Corin Nemec talked with fans and signed autograhps. Angus Oblong was present in all of his comic self. Thomas Jane and Tim Bradstreet gave a great behind the scenes presentation for their movie Dark Country. And much, much more! So, follow the links to refresh your memory on what you experienced while at the LBCC; or, if you couldn't make it this time around, see it as if you were there. Enjoy the photos we at the IN show collected while at the unforgettable Long Beach Comic Con! 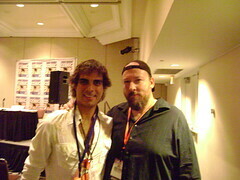 Tim Bradstreet is an Eisner Award nominated illustrator. He was voted Best Artist by the Horror Writers Guild of America. He remains as the regular cover artist for two books, Marvel's The Punisher and Vertigo/DC's Hellblazer; and, is best known for his work on comic books (covers and interiors), book covers, movie posters, role-playing games and trading cards. Tim has been working professionally ever since he graduated high school in 1985. Primarily self-taught, he began shaping his talent under the tutelage of fellow illustrator Steve Venters at Fantasmagraphics. As most know, it was with Venter's guidance that Tim began illustrating and thus honing his skills while pursuing his long-time ambition to draw comics. Never one to shy away from opportunity, Tim Bradstreet is a working and developing partner in RAW Studios - founded by actor Thomas Jane (of The Punisher, The Mist, The Mutant Chronicles, and more). The "IN" show was fortunate enough to get a fantastic interview with Tim; and, it will be broadcast on Thursday, 25 November 2010 at 1p.m. Be sure to tune in for a listen! Tom Kirkbride is riding the top of a galactic wave! With only 3 years into his books, the "Gamadin" series is set to make literary history! Tom, a Southern California native who grew up on its beautiful beaches, has focused his story around some surfers who find themselves surfing the galaxy in search of a ship that holds more than its fair share of secrets! What is most striking about Tom Kirkbride is his determination to provide characters that are strong, stories that have substantial plots, and a ripe field for heroes-in-the-making. To say the least, that determination has paid of because it was clear to attendees that Tom Kirkbride was quite the celebrity at the Long Beach Comic Con 2010! With his books flying off the shelf, a new book ready for publishing, and another one in the works, Tom still managed to take time with the "IN" show. On that note, we say "Thanks, Tom, for an inspiring interview!" Now, for those of you who have yet to check out his books, they can easily be purchased through Amazon...Gamadin 3 Vol. Limited Edition Box Set ; and, be sure to visit Tom online at Gamadin.com. While at the Long Beach Comic Con 2010, the "IN" show spoke with Mitch Schauer. Mitch Schauer has rightfully garnered a long and worthy list of achievements. In addition to the work he has accomplished on his own, Mitch has done work for Hanna Barbera, Film Roman, Warner Bros., Nickelodean, and many others. While exhibiting at LBCC 2010, Mitch was promoting a particular project of his that has taken off like wild fire: RIP, M.D. Enjoy the interview and be sure to visit Mitch online at SonOfAMitch.com; and, get your copy of RIP, M.D. from Amazon today! Premier American illustrator and highly revered comic creator, J. Sott Campbell was busy talking with fans at the 2010 Long Beach Comic Con. While in attendance at the 2010 Long Beach Comic Con, well known author, illustrator, and all around evil mastermind of such classics as "Creepy Susan," "13 Other Tragic Tales for Troubled Children," and the television series "The Oblongs" was busy doing what he does best: playing it up to the fans, staying true-to-form for the media, and making the convention extremely entertaining for all those around him! If you haven't already checked out Angus' work online, well, we'll tell you what he would, "Get going...duh!" So, check out Angus Oblong here, here, and here ; but, only AFTER you've watched the interview! LBCC - Episode 1: Corin Nemec, Mike Hess, and J. Scott Campbell. LBCC - Episode 2: Elizabeth Watasin, Carly Mizzou Wagner, and Kit Steinkellner. A conversation with Phil Lawrence and the IN show. an exclusive preview of LBCC 2010.